On today's interview, best-selling author, thought-leader, and business development coach, Latoya Johnson shares her expertise on how healthy self-love positively impacts your life and your business. 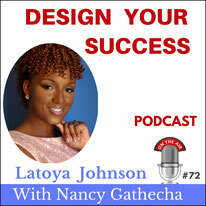 Trained and mentored by Les Brown, (my all-time favorite transformational speaker), Latoya is a purposeful and unapologetic woman who has become a master networking powerhouse and communicator. Our conversation has thought-provoking perspectives for both men and women who want to enjoy healthy relationships. Although self-love is not limited to ladies, Latoya's main goal is to empower women to discover and maximize their value, so they can be greater assets in their homes with genuine love and understanding. Her message inspires her audiences to redirect their lives by adopting new thoughts, habits, and behaviors to live more fulfilled lives. We talk about why the world needs to hear YOUR unique message or story because there are people who are called to hear with their hearts when you speak. While others hear with the ears. The heart listener's lives will be powerfully impacted so by playing small you do us a disservice. Tune in and discover why being financially free is not selfish, greedy or bad. Quite the opposite. As a woman, we are not to see men as a paycheck. And men - your value to us should not be based on your possessions. But on your position in the home and relationship. Our candid conversation also covers how we women can handle body-shaming, how to rewrite negative programs installed in our minds from hurtful words emotional abuse. And how you too, can begin practicing healthy self-love with just two simple tips. *Spoiler alert* - Tip #1 is get Latoya's book. You'll be glad you did and you may even get a second copy to gift someone you care about. I read it and it´s good. She's walking her talk beautifully. Enjoy the interview, then be sure to share your thoughts on self-love below. Happy listening! Connect with Latoya on Facebook. Have your say, share your thoughts on self-love below.